We have a couple of updates about Duet, the recent film by Glen Keane. The film is part of the Encounters Short Film and Animation Festival 16 – 21 September 2014 Bristol, UK. Duet will be shown Friday Sept. 19. In 2014 Encounters Festival will celebrate its 20th anniversary. DOWNLOAD THE 2014 FESTIVAL GUIDE HERE. Duet will be shown VIEW Conference in Turin, Italy in a presentation called The Duet of Tech and Art – How technology and artistry elevates us to a higher place. 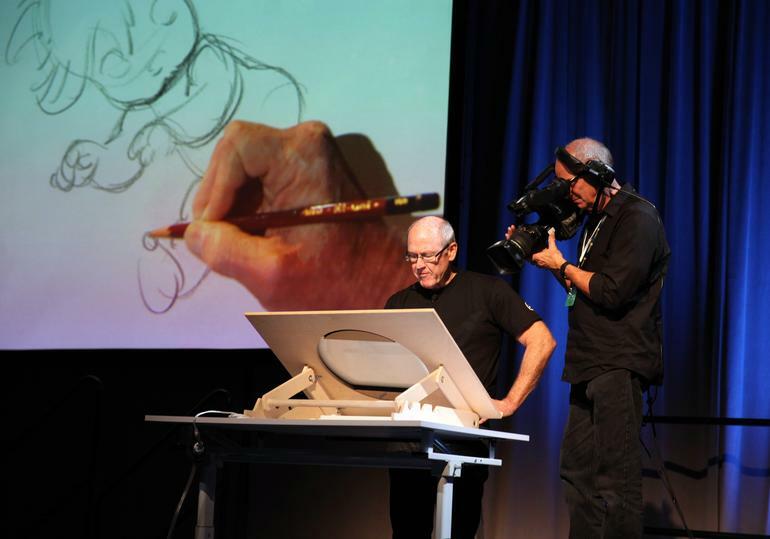 Keynote presentations will be given by Glen Keane as well as Pixar Co-Founder Dr. Alvy Ray Smith. Smith co-invented the concept of the alpha channel and directed the milestone “Genesis Demo” in the 1982 film Star Trek II: The Wrath of Khan. His website is here. Glen Keane is known for drawing and animating the Beast in Disney’s Beauty and the Beast, Tarzan,and Aladdin. Recently, through Google’s Advanced Technology and Projects group, he directed and created Duet, now available as a cinematic version of a future, interactive, hand-drawn animated story for mobile phones. Acclaimed animator Glen Keane unveiled a first look at his latest and most personal project to date, DUET, as part of a special ATAP (Advanced Technology and Projects). Animated in its entirety and directed by Glen Keane (former Disney animator and creator of such beloved characters as Ariel, Beast, Aladdin, Pocahontas, Tarzan and Rapunzel), DUET tells the story of Mia and Tosh and how their individual paths in life weave together to create an inspired duet. The unique, interactive nature of the story allows the viewer to seamlessly follow the journey of either of the two characters from birth to adulthood. DUET is the third in a series of Spotlight Stories, which is a new way of telling stories on mobile devices. The stories blend world-class artistry with innovative rendering and interaction technology for mobile to create a new canvas for the next generation of storytelling. DUET is the first traditionally animated, hand-drawn film to debut as a Spotlight Story. The film offers a glimpse into what’s possible on mobile devices, a rich,modern canvas for creative expression and immersive works of art and technology. DUET will officially launch later this year and will be available on all capable devices with proper hardware capabilities and OS version higher than Android 4.2.